At my recent doctor’s appointment, he asked me whether I was eating enough. This was a comment on my lethargy and my abdominal issues, of course, because I was there for my mystery discomfort and loss of appetite that he was not completely able to diagnose. But his question has given me pause over the last week and a half. I’ve been reflecting on the change in my eating habits as well as the way I select groceries, and I’ve decided I need to lighten up a little bit and get more creative rather than give in to exasperation and despair. Toward the end of every work day for the last week, I took one of the muscle relaxers the ER prescribed to me for discomfort. Friday was tougher, for some reason, the discomfort blossoming into pain. I went home from work at my regular time, opted out of dinner, and got into bed at 7:30, where I remained for much of the following 12 hours. The next morning, I was not hungry. Again. I was weak, though, and I knew I had to eat something, so I made myself a breakfast scramble of eggs, ham, and cheese. Breakfast didn’t cut it, and I had some steamed vegetables for lunch. To my surprise, I was still hungry a couple of hours later. Not at all to my surprise, though, I didn’t want anything we had in the house. 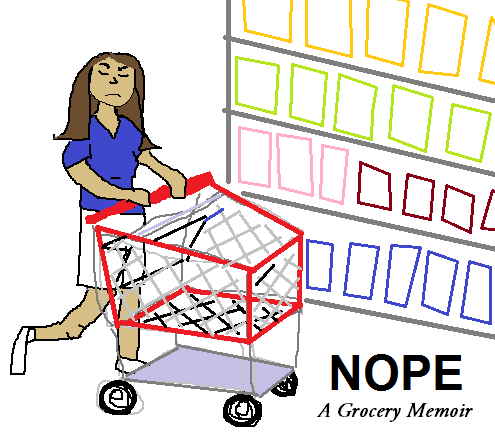 I have hardly gone grocery shopping for the last 3 weeks, and the pantry and fridge were bare of my staples – carrots, snap peas, macadamia nuts, other things that were easily snacky for me. All the eggs went into breakfast, too. So I went to the grocery, moving more slowly than usual and pausing in the aisles to catch my breath at times, looking over my grocery list on my smartphone while eyeing the goods in search of something new or special for myself. Many foods I rejected on the basis that they were grain-based or contained vegetable oil, since they’re not on my current diet. I remember being disheartened by the soup aisle, with so few lower-carb options and nothing that fits in with my doctor’s current guidelines. The story of my life will be released in serial. My eyes alit on chicken stock – which my brain translates as “chicken juice;” thanks a lot, brain – and I picked up a couple of cans of that. Maybe I will throw it into a pot with some frozen vegetables and make a soup, add in some cauliflower that’s been “riced” (shredded with a fork to resemble rice), add spices. That seemed more appealing than further disappointment from reading labels. As I perused the endless canisters of peanuts and cashews, I found a cranberry-almond trail mix with pepitas and raisins. I looked at the sugar content and almost didn’t put the bag in my basket. But then, I thought about the fact that almost no food is appealing these days. Chicken is always appealing. Vegetables will be eaten automatically, and I love the crisp fullness of cold plants with their little vacuoles full of water. Mmm, crunchy science. Everything else on my plate is begrudgingly eaten. Most cheeses are mentally rejected before I even prepare my to-go lunch in the morning. Even my favorite dessert of frozen berries isn’t working for me; I ate a third of the portion I gave myself after dinner last night and put the rest back in the freezer, where I fear I’ll have to confront it again tonight. I realized that I was walking a fine line. I both shut down foods that I don’t want to eat because they’re not in line with my diet and eliminate foods I don’t feel like eating… and that leaves me with fewer and fewer options, to the point where I need to get creative to make lunch sound appealing again so that I don’t get yet another fast food salad (so easy to do), so I do get enough calories in a day. I need to start counting my calories again and, if I’m not eating enough, hold myself accountable for a number that’s at least over 1,000. For breakfast this morning, I had an energy bar, apple juice, and hard-boiled eggs. My lunch is raw blueberries, raw carrots, button mushrooms, a tiny hunk of Baybel cheese, and a marinated chicken breast. And I have two ounces of the cranberry trail mix in a baggie to serve as a snack. I’m consuming more sugar today than I do usually, especially with the juice (though I read the label and saw there was no added sugar), but it’s coming from better sources than corn syrup, and I believe that I need the energy. On days I’ve felt particularly weak, I’ve done 2oz-4oz shots of fruit juice in the morning. 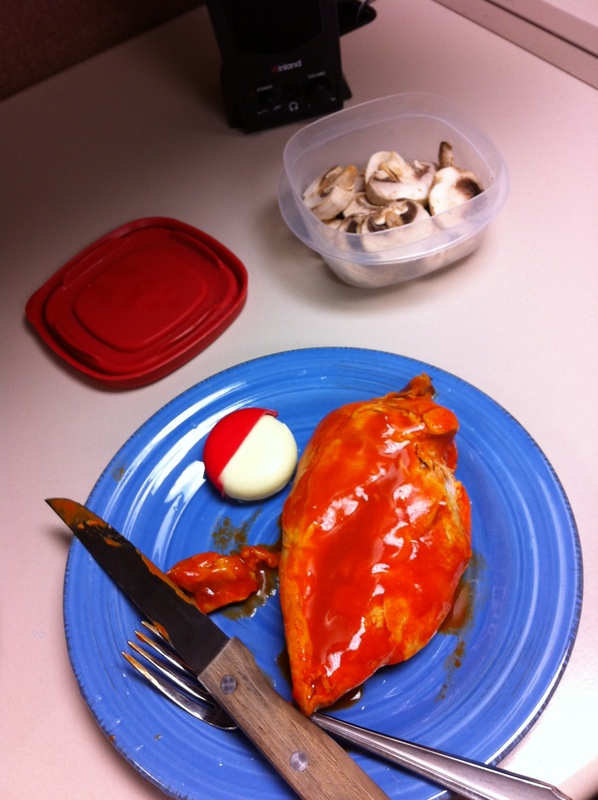 Lunch: fire chicken, a Pokeball of cheese, and button mushrooms to soak up all that hot sauce. Now this is an interesting lunch. For the time being, my focus should be more on solving the mystery of my health and less on sticking to the eating lifestyle that’s let me lose weight, and my food choices will reflect that from here on out. Not to say I’m going to start in on fried chicken and biscuits, but I will find ways to work around my current tastes to get enough calories and nutrients to keep my body going. This entry was posted in health, weight loss and tagged cartoon, food, health, low carb, mood, Photos, weight. Bookmark the permalink.